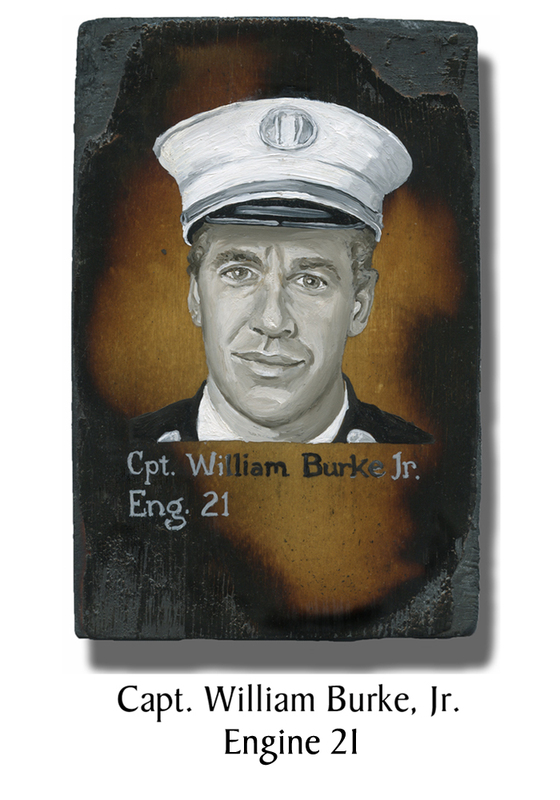 Captain William Burke, Jr., was a handsome bachelor who followed his father into the FDNY. Calling him “a firefighter is a little like referring to Elvis as an entertainer.” “He always made everything better,” said his brother. An instructor at the fire academy, “Billy” was an FDNY veteran of more than two decades. On 9/11, he and his men of Ladder 21 were in the North Tower evacuating a handicapped civilian and others. He ordered his men out and continued searching. His men survived. This entry was posted in Better Angels Stories, Uncategorized and tagged 343, 9/11, better angels, Dawn Siebel, Engine Co. 21, FDNY, firefighter, firefighters, firefighters of 9/11, LODD, Manhattan, memorial, NFFF, paintings, portraits, William Burke, World Trade Center, WTC. Bookmark the permalink. One Response to Capt. William Burke, Jr.